ZOPO is not well-known Chinese Gadget Manufacture like other Companies Huawei, ZTE, and Xiaomi all these Companies are world wide known. In November 2013 ZOPO introduced Octa-Core with Android. Now ZOPO give us another milestone in Android history by launching its unbeatable device i.e. 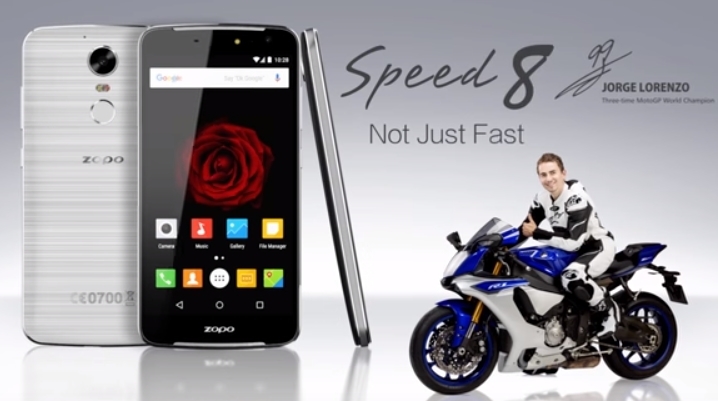 ZOPO Speed 8 smartphone, the first Android device in the market with a deca-core processor + 4 GB RAM & 21 MP. ZOPO Speed 8 is Equipped with Android 6.0 Marshmallow, Mediatek Heli0 X20 Deca-Core (10 Cores), 5.5-inch Full HD, 4GB Ram with 32 GB Storage and 3600 mAh Battery with Fast Charging option, 4G LTE. Speed 8 comes with 21.0 Mega-Pixel Rear Camera, The camera is coupled with the top-of-the-line Sony IMX230 sensor - a type 1/2.45 stacked CMOS image sensor, smaller than 1/2.3-inch making the image more clear and refined than ever. 8 Mega Pixel camera see on Front Side. Other Features are Fingerprint Scanner for unlock the screen and Snap picture, USE type-C with Reversible plug orientation means no matter how to put the connector, brushed metal-like look, NFC (Near Field Communication) Your phone is your wallet for money transactions and many other operations.